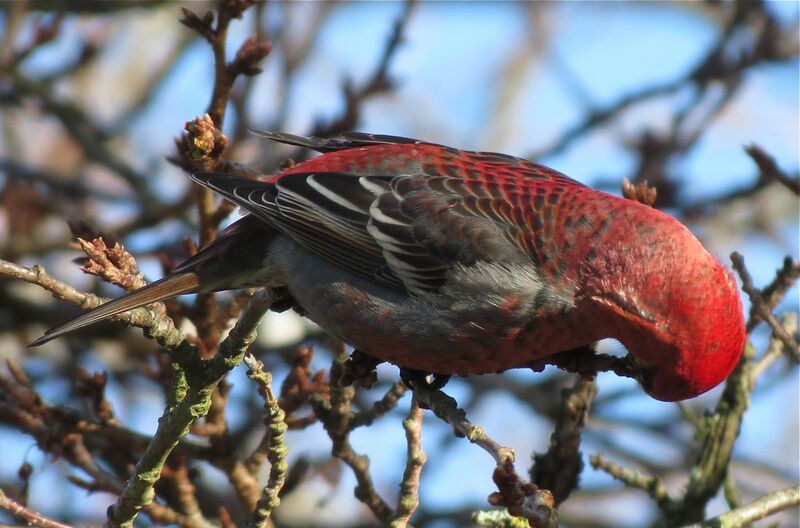 It’s not every winter that Pine Grosbeaks show up at lower elevations of the Lower Mainland. But what a treat it is when they do. 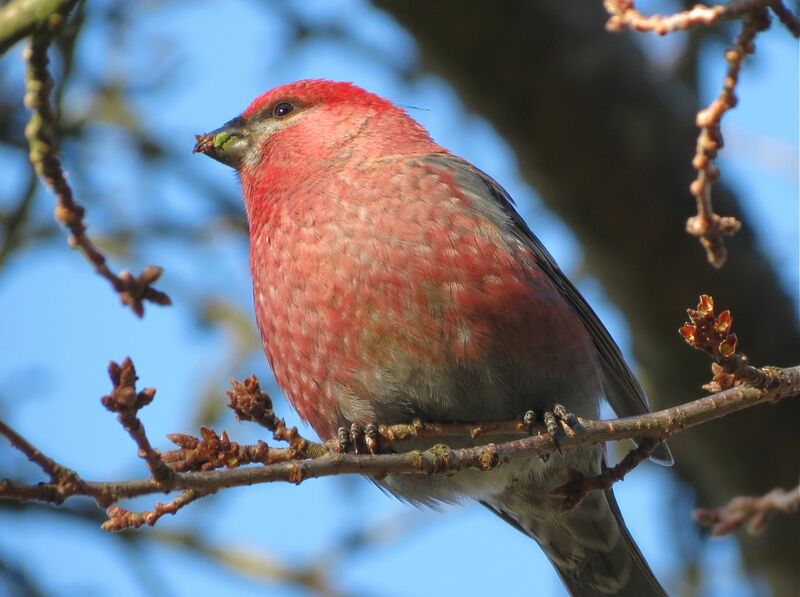 The beautiful male shown above is one of a flock of at least fourteen birds that are providing a show for visitors to Burnaby Mountain where they can be found feasting on the buds of the flowering cherry trees that line the path south of Horizon’s Restaurant. 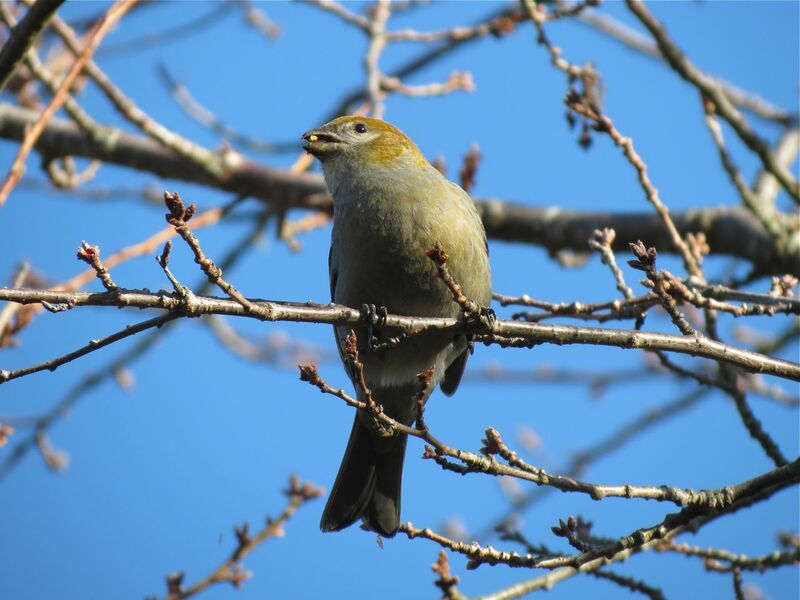 In the West, this large member of the finch family is usually found in the coniferous forests of the mountains where it breeds. More commonly seen in lower elevations in the Interior, it only rarely puts in an appearance in coastal areas of southern BC. These irregular movements to lower elevations are called irruptions, and are perhaps related to changes in food supply, but like many aspects of this species’ life, the phenomenon is poorly understood. 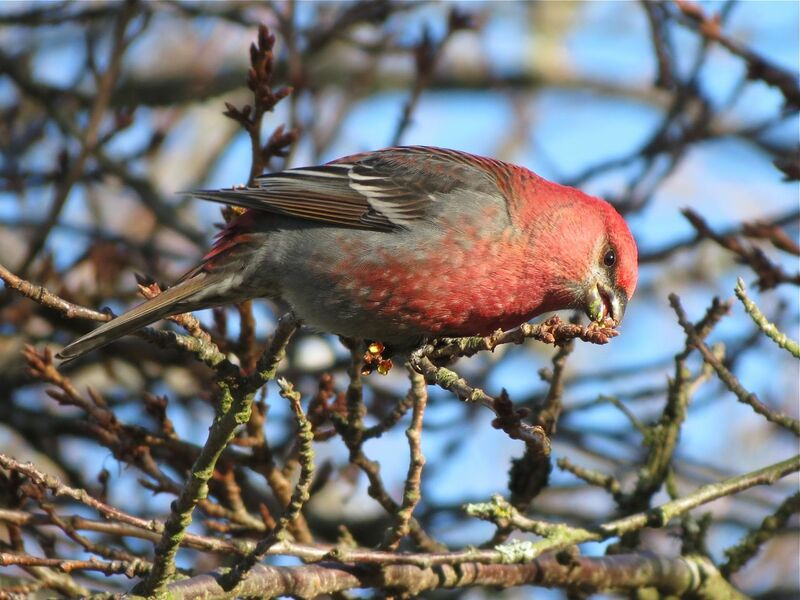 Found across the continent, mostly in Boreal Forest regions, the Pine Grosbeak’s range also extends to Eurasia where it is found from Eastern Asia to Scandinavia. Despite the wide geographical range of this species, it’s likely that the different populations do not wander very widely from their home territories. Our visitors to Burnaby Mountain have likely not travelled great distances to get here. Males and females are very different in appearance. The females’ colouring is more subdued, a subtle mixture of grays and greenish gold. This cryptic colouration is no doubt important during nesting, when the female is the only one of the pair to brood the eggs and chicks. Both parents, however, share in feeding the young. While the males and females in the flock are easy to pick out, there are also a couple of differently plumaged individuals in the flock. The one below shows a lot of red on the head and neck in an otherwise female plumage. This individual may be a first year male, not yet fully red, or a female that is more colourful than is typical. Given these birds live mostly in inaccessible mountain forests, it’s perhaps not surprising that they tolerate close approach by people. It appears they do not see humans as potential danger. 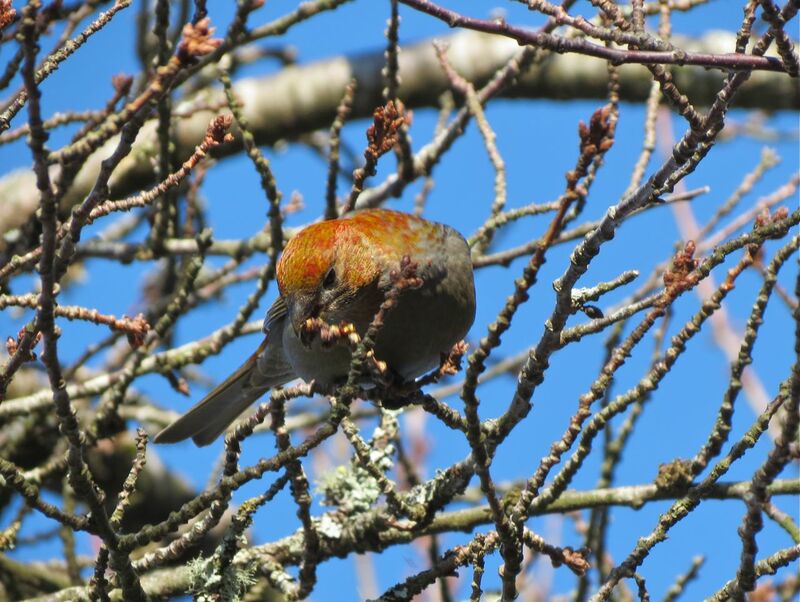 If you pay a visit to the cherry trees on the mountain, make sure you take a camera or binoculars. Move slowly, without sudden movements, and you’ll be rewarded with close views of the birds unconcerned with your presence. You will get the opportunity to see some of their more subtle features in close-up, for example the striking back pattern on this bird. So enjoy them while they’re here; it may be many years before we see them again.